A real estate client who closed on a home one week ago calls to tell you “There’s nothing left.” On top of that you find out your office is destroyed — the roof collapsed — and you don’t have rental insurance. These are the types of challenges Alissa Spears, an independent brokerage owner and 18-year real estate vet in Rockport, Texas, is dealing with from her remote base four hours from the coastal town of 9,500. She and her family fled to a bed and breakfast in Blanco, Texas, Thursday evening, heeding the advice of emergency authorities to get out of Dodge amid the threat of Hurricane Harvey. A Category 4 storm is the last thing you wish upon your beloved community and 14-month-old thriving business, and Rockport was left battered with no telling when residents will get their power back. But the Australian-born Spears, founder of Spears & Co, is determined to be productive and remain relevant in a town that she may not be able to return to for weeks. By Sunday, Spears had some concrete ideas for how to take action this Monday morning. She had reached out on the CRS Facebook Group “We are CRS” soliciting advice. 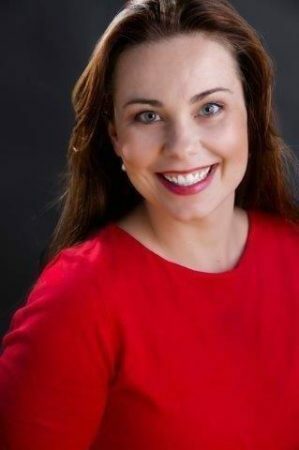 “A number of specialists came forward and said, ‘I’ve been through this before, I’ve been through Ike and Rita, and here’s what you need to do: Create a page where your community relies on you,'” Spears said. 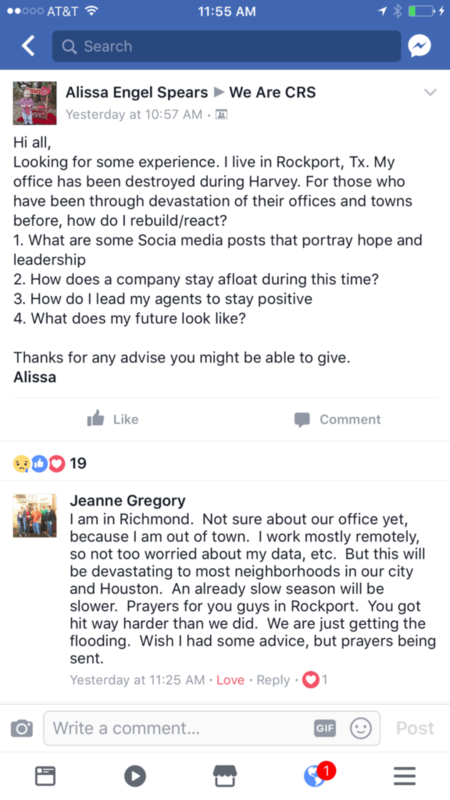 First thing this morning, she put together a Facebook post with recommendations for trustworthy Rockport contractors, starting with calling the contractors to get their blessing before listing them. The post, a handy resource for people needing home repairs in her community, has already attracted 2,600-plus views and 87 shares and counting. The CRS community had the answers, she said. Getting up at 5 a.m., taking their suggestions to heart and being productive not only helped Spears’ morale but also created buzz around her company. “I can’t wallow; I don’t want pity,” she said. Spears has also been in touch with each of her six agents via text and email, checking in on how they are and how their homes are faring. “I want to boost morale, touch base and give them a plan of action, but right now a lot of them are still in shock,” Spears said. Counting her blessings, Spears added: “At least we didn’t have a 20-foot wall of water wash over the town, which I was very concerned about. 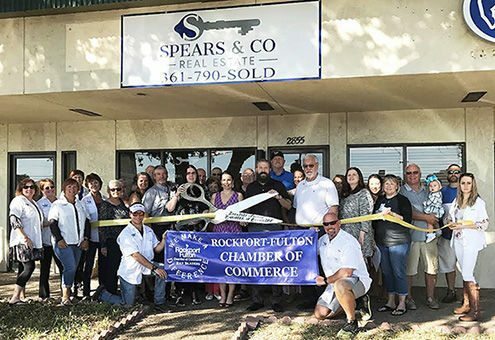 The Spears and Co. office at its opening. Spears doesn’t expect to be back in Rockport for a stint; she has a son with epilepsy who needs to be near a hospital if he has an attack. Those who stayed in town have checked out her home, and it survived well, so she has that peace of mind. Some sleepless nights are to come, as parts of the contract Spears is used to brushing over will be examined with a fine-tooth comb.